Rainbow Explorers strives to provide opportunities for African-American homeschoolers in Arizona to meet and get to know one another. Additionally, we hope to provide resources, help and encouragement to African-American homeschoolers and the homeschool community at large. We feel that homeschooling is not only a great educational choice but a wonderful way to live and raise children. In a country where the public school system is failing our children we are thankful for the opportunity to let our children be educated at home in a natural and wholistic environment. We encourage you to enjoy your homeschooling journey. Learning can be fun. Turn off the T.V., laugh and play, read real books, enjoy nature, serve others, explore and discover. Are you interested in finding out more about the different ways there are to homeschool? Or about how to incorporate notebooking and lapbooking into your homeschooling ? If so, please check out our "New to Homeschooling?" page even if you are a veteran homeschooler. May God bless you as you raise your children. Rainbow Explorers encourages you to turn off the T.V. and explore life with your child. 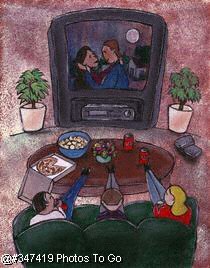 Click the couch potatoes to learn more about life without T.V. Join the Rainbow Explorers Yahoo group and meet other African-American Homeschoolers in Arizona!